It’s that time of year again. Time to get dialed in for Ironman Texas. You’ve done the long rides, ran the long runs, and now it’s time to go for a long swim in Lake Woodlands. A 1.2 mile loop will be marked with the full support of lifeguards and boats. They will also have vendors and a bag drop to leave your stuff while you swim. Starts at 7:30am and be sure to get there on time, as they will stop letting athletes in the water at 8:30am. Please note that the entire Ironman Texas course will not be available. 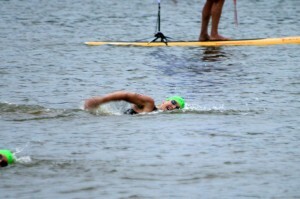 Swimming up the waterway is a big no-no before raceday. After the Ironman course closes, they will move the buoys and set up the CB&I practice swim course. This will be a 500 meter triangle for those competing in the CB&I Triathlon on May 5th. Worried about your first Ironman swim or the CB&I Triathlon swim? Then sign up for the clinic I’m putting that morning. We’ll go over the course, what to watch for, what to watch out for, tactics, worries, you name it. Bring your questions and I’ll be happy to answer. You can sign up by calling 281-210-3950 and ask for TJ Fry’s swim clinic.